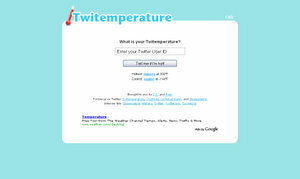 Twitemperature is a gauge telling you whether you’re hot or cold on today’s topics of concern. Twitemperature ignores meaningless points of measure like number of followers and number of people you are following, and instead focuses on what you’re actually saying, now. We poll your last several hundred tweets and score what you’re saying against what everyone else is saying in current hot conversations on Twitter and elsewhere. Who Should I Follow recommends people to follow on Twitter.